After spending months researching and writing, your manuscript, your masterpiece, is complete. Maybe you’re trembling with anticipation or nerves; either way, you submit your writing to a contest, agent, or publisher. Exhaling shakily, you sit back and wait for the kudos and recognition you deserve. Just like in sports, you win some and you lose some, but that doesn’t stop the feeling of pain and grief when a rejection pops up on your phone or lurks in the mail. Some writers might feel the urge to give up. What if I’m not good enough? What if no one will want my writing? Am I really meant to be a writer? The truth of it is, everyone receives rejections. Even J.K. Rowling was rejected multiple times before her famous Harry Potter series was selected by a publisher. It is not the end of the world, no matter how much you think it is. In the past month I’ve received four rejections from literary contests. Does it hurt? Yes. Am I giving up? Of course not! Writing is my passion, and I won’t let a few rejections stop me. In fact, I have a plan. I’ve created a box where I keep paper copies of my rejections. When something is finally acquired, I’ll rip those rejections up and turn them into confetti. That keeps me going. So what should you do if you receive a rejection? Here are just a few ideas. Breathe. 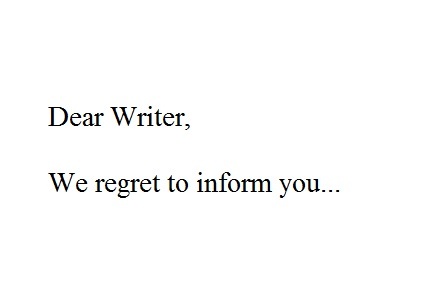 This won’t be the last rejection letter. Pick yourself up and carry on. Keep writing. Being denied does not mean you are a bad writer. Don’t. Give. Up. Listen to constructive criticism. It’s rare when agents or publishers provide feedback in their letters, but if they do, take that critique and learn from it. It can make you a better author. Consider revising: Perhaps you missed a few errors in your writing. This is the chance for you to recheck your work. Try again. Don’t let one rejection stop you from sending your work out again. Keep a rejection box of your own. If you believe in your work, then you’ll find a way to get it published either through a publishing house or self-publishing. Don’t give up!